Thomas Pomponio outlasted a giant field of 18,054 to reach the poker pinnacle in Event #5: THE COLOSSUS III - $565 No-Limit Hold'em. 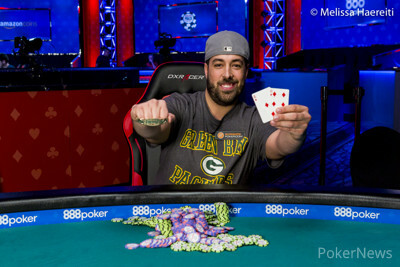 Pomponio took home $1,000,000 for his outstanding performance, along with his first WSOP bracelet. "It feels... just surreal," the Champion said. Pomponio's live tournament cashes had totaled less than $140,000 before he entered this tournament. 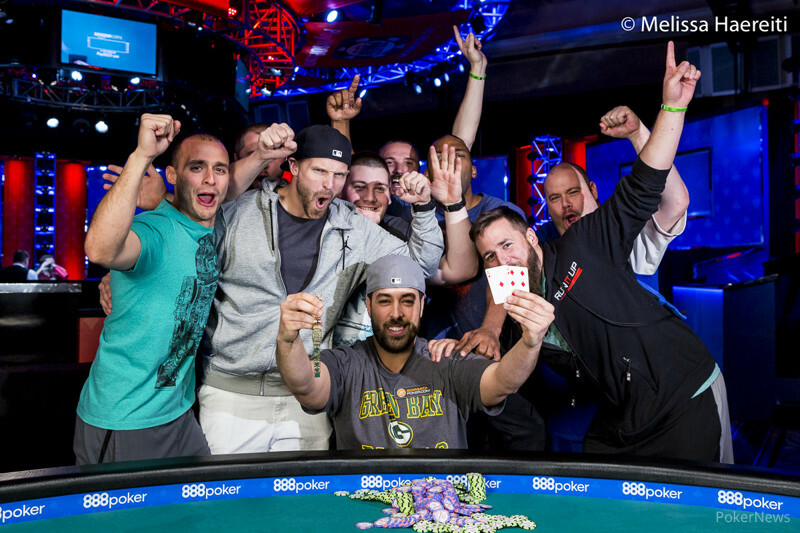 Earning a seven-figure score is certainly an amazing feeling for anyone who makes their breakthrough in poker, but for Pomponio, the bracelet is even more meaningful. "Ever since I was a kid, I was dreaming about sitting there and holding that gold," said Pomponio, who hails from New Jersey. Pomponio came back for the final table fourth in chips. There were only about 180 big blinds in play, and all of the finalists played at a high tempo. Most of the decisions were made within just a few seconds, and the fast-paced action brought the casualties early. The eventual Champion was involved in the pot that saw the first player lose his stack. He held ace-king and so did Erkut Yilmaz, who also joined the contest against Luke Vrabel, whose ace-deuce didn't find any help on the board. Eleven hands into the final day, the field was reduced to seven players as Matt Affleck, the biggest star on the final table, sent his short stack to Kent Coppock. Just like Affleck, Ralph Massey couldn't get much going, and he never bounced back from the ten big blinds he maneuvered. He hit the rail in seventh place. Taylor Black's tournament was on the line when he shoved with nine-seven of clubs, running into the ace-queen of diamonds of Kent Coppock. Black, however, flopped a flush to soar into the chip lead. Coppock's stack took a massive hit, but he laddered one more pay jump. Erkut Yilmaz clashed with pocket fours against John Hanna's aces and walked away in sixth place. With that knockout, Hanna suddenly guarded more than third of all the chips in play. Hanna, however, wasn't among the dominant players on the final table; Pomponio and Black were the ones who kept things rolling. Pomponio knocked out Coppock in fifth, holding Big Slick against a weaker ace. Then it was Black's turn, tangling with start-of-day chip leader Mark Babekov in a brutal cooler. Babekov's queens couldn't hold versus Black's ace-king as the king of diamonds landed on the turn. Black took over the lead and finished Babekov off the following hand. 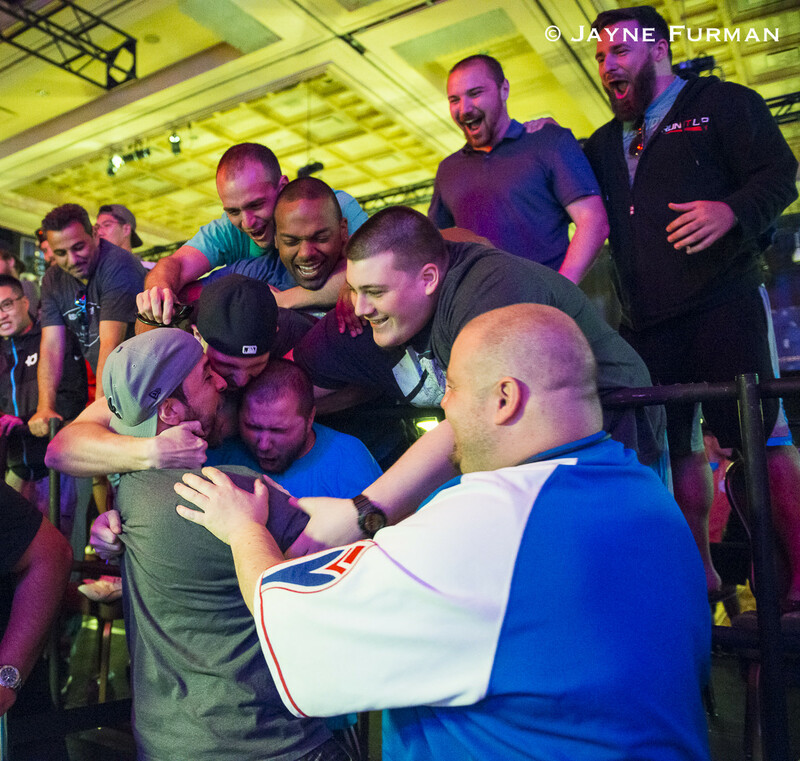 Black held more than 50 percent of the tournament chips to begin three-handed play, and his railbirds were ecstatic. Pomponio was the shortest stack among the three remaining players, but the meat cutter from the east coast was relentless. Pomponio shoved on Black several times and always took the pot without contest. The final duel was set when Pomponio's ace-high held strong in a preflop war against Hanna's queen-ten of clubs. Hanna's hand improved to a flush draw on the flop, but the rest of the board bricked. Playing for a pay difference of close to $500,000, Black started the heads-up match with about a five-to-three chip lead. That dramatically changed after four hands, though. The two were both dealt a strong hand for heads-up play, which resulted in Black's five-bet shove with ace-ten. Unfortunately for him, Pomponio had ace-king. Black first thought he got there when he saw a ten hitting the felt, but the flop also included a king, and the better starting hand stayed firmly ahead. Pomponio earned a huge lead and he never relinquished it. After 142 hands played on the final table, he remained the last man standing, with all the chips of all 18,054 entrants. 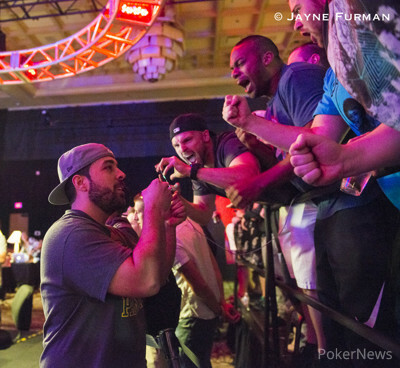 As the story unfolded, Pomponio became this year's second WSOP winner to collect a seven-figure prize, following the One Drop High Roller Champion, Doug Polk. Hand #142: Taylor Black shoved all in from the button and was quickly called by Thomas Pomponio. The flop put Black in terrible shape when it came , giving Pomponio a flush draw. The turn was the , providing no extra outs, and the river was the , leaving Pomponio as the Champion of Event #5: The Colossus III No-Limit Hold'em. Black collected $545,480 for his second-place finish. Hand #137: Thomas Pomponio raised to 2,500,000. Pomponio and Taylor Black checked through a board of . Pomponio turned up and that was good enough to take down the pot. Hand #138: Pomponio received a walk in the big blind. Hand #139: Black received a walk in the big blind. Hand #140: Black shoved all from the button and Pomponio folded. Hand #141: Black received a walk in the big blind. Hand #125: A walk for Taylor Black. Hand #126: Taylor Black raised to 2,000,000 but released his cards quickly when facing a three-bet from Thomas Pomponio for 6,000,000 or so. Hand #127: Thomas Pomponio min-raised and Black replied with an all-in. Pomponio didn't have it. Hand #128: Taylor Black steals Thomas Pomponio's big blind with a raise to 2,000,000. Hand #129: Thomas Pomponio limped in and Taylor Black checked. The pot remained of the same size all the way through the board . Black had only eight-deuce and couldn't beat Pomponio's . Hand #130: Another raise-and-take for Taylor Black. Hand #131: Thomas Pomponio called and folded to Taylor Black's all-in. Hand #132: Thomas Pomponio got a walk. Hand #133: Thomas Pomponio raised to 2,000,000 and Taylor Black matched the offered price. The flop was checked by both players but Black led out for 2,000,000 on the . Pomponio folded. 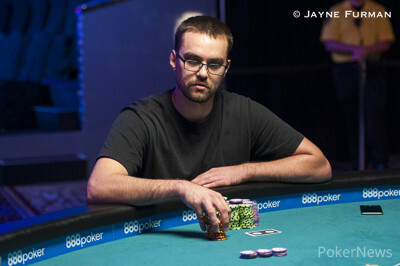 Hand #134: Taylor Black raised to 2,000,000 and won the pot. Hand #135: Thomas Pomponio made it 2,000,000 to go and Taylor Black came along. Black then check-called another 2,000,000 on the flop and the and were tapped by both players. Pomponio took it down with . Hand #136: Taylor Black min-raised and when Tom Pomponio called, the hit the felt. Pomponio then check-raised Black's bet of 1,600,000 up to 4,500,000. Black called but gave up when Pomponio barreled the turn for 5,500,000. Paul Giamatti, Damien Lewis, and Andy Frankenberger? 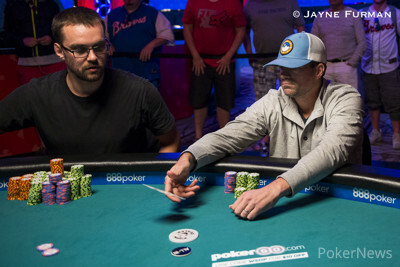 Hand #118: Taylor Black raised to 2,000,000 from the button and Thomas Pomponio folded. Hand #119: Pomponio raised to 2,000,000 from the button and Black folded. Hand #120: Black raised to 2,000,000 from the button and Pomponio called from the big blind. The flop came and Pomponio checked to Black. Black bet 1,600,000 and Pomponio called. On the turn, Pomponio checked again. Black bet 4,500,000 and Pomponio folded, awarding the pot to Black. Hand #121: Pomponio raised to 2,000,000 and was called by Black. The flop came and Black checked to Pomponio. Pomponio bet 2,000,000 and Black called. Both players checked on the turn. On the river, Black led for 3,000,000. After giving it some thought, Pomponio called. Black showed for a missed straight draw. Pomponio showed for a pair of eights and that was good to take down the pot. Hand #122: Black folded the button and Pomponio got a walk in the big blind. Hand #123: Pomponio raised to 2,000,000 and Black moved all in. Pomponio folded and Black took it down. Hand #124: Black raised to 2,300,000 and Pomponio folded. Hand #114: Thomas Pomponio received a walk. Hand #115: Taylor Black received a walk. Hand #116: Taylor Black raised from the button and took Pomponio's big blind. Hand #117: Thomas Pomponio opened for 2,000,000 and Taylor Black three-bet to 6,000,000. Pomponio wasn't going anywhere. He moved a tower of 500,000-chips out front together with a smaller one, a four-bet worth 13,500,000. Black announced he was allmin and Pomponio wasted no time before calling. Black first saw the and immediately reacted, "Ten!" But in a microsecond added an, "Oh," as the dealer rolled over the flop. Pomponio faded the remaining two tens on the turn and river, securing a giant double-up for 33,125,000. Hand #113: From the button, John Hanna moved all in. Thomas Pomponio moved in from the small blind. Black folded and the two players turned up their hands. The board ran out which locked up the pot for Pomponio with ace high. Hanna will take home $406,474 for his third-place finish.